steer emerged from the trailer, and was led to the hotel door by a man and an eight-year old boy wearing western clothes. The trio paused in front of the door for a photo with a group of people similarly attired, including Kamloops Mayor Peter Milobar and Councilor Tina Lange, then strolled into the hotel. Had the old West come to life again? No, it was just a rancher auctioning off his steer. In the hotel lobby. 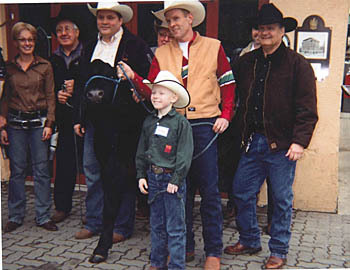 The event, a combination of history and marketing, recreated an era when the beef industry was a vital component of B.C.’s economy and the yearly Provincial Bull Sale was central to the ranching world. Doug Haughton, rancher and owner of Norman, the black Angus steer, reminds people celebrations around that Bull Sale included auctioning champion bulls in the lobbies of both the Plaza and Stockman’s Hotels. When Tina Lange, part owner of the Plaza, asked about a 1956 photo of the hotel lobby showing then Mayor Jack Fitzwater standing directly in front of a very large bull, accompanied by ranchers and other dignitaries, Doug explained the bull sale custom. Tina thought they should do it again. Doug discouraged her from using bulls. “They could get too rambunctious.” He offered Norman, a prize-winning year old steer. Norman was a twin whose mother rejected him. He was hand-reared, and bottle-fed. He’d been to the winter fair, and the petting zoo. He’d visited schools to educate kids about cattle. Norman was familiar with people. Doug had him washed and clipped for his star performance. Norman, Dave Sage holding Norman, Dave's son, Kolby, beside Norman. Norman was calm and poised in spite of the crowd. He stood quietly while Tina explained the history, thanked the agricultural community for its contribution and said the auction and the Plaza’s featuring Haughton beef on its menu is the hotel’s way of recognizing the value of ranching. 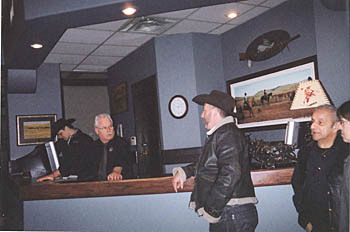 Mayor Peter Milobar noted how important the cattle industry is to Kamloops. Then auctioneer Wayne Jordan took over. Norman was sold for $7,500.00 to Scott and Yvette Innes of Innes Livestock who will give it to their grand-daughter for a 4-H project. Norman’s sale price tied a record price for a grand champion 4-H calf. Summing up the experience Tina Lange said the mixture of history and fun encourages local restaurants to offer local produce. To Doug Haughton it’s innovative marketing aimed at keeping the cattle industry viable.